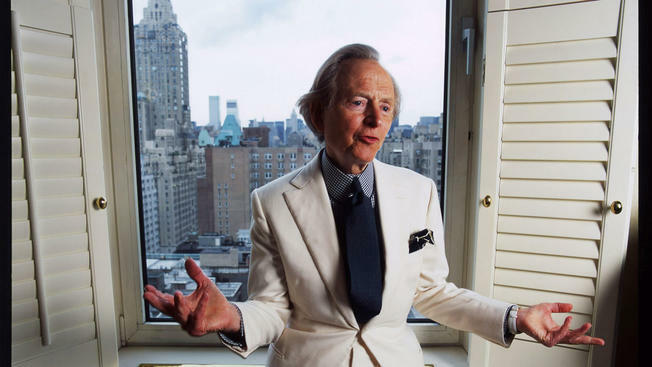 The American writer Tom Wolfe who has died aged 88 was known almost as much for his flamboyant dress (white suit, Homburg hat, two-tone shoes) as his prose. 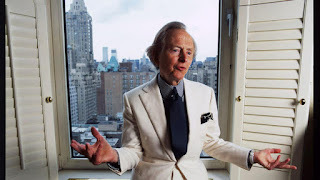 Wolfe styled himself a "Southern gentleman" and, despite many years residence in New York, you could still pick up the trace of a Virginia drawl in his speech when he gave TV interviews. Beginning as a journalist in the fifties, he went on to document the late sixties counterculture movement in The Electric Kool-Aid Acid Test and, like Dickens, used material from his reporting in fiction, especially in his first, and best known, novel, The Bonfire of the Vanities, which, again like Dickens' early work, was serialised in a magazine before being revised and published as a single volume in 1987. The Bonfire of the Vanities has been called the quintessential novel of the 1980's, but it also one of the great late twentienth century New York novels which, alongside those of Don DeLillo, explore the racial and class divisions of the city, divisions which, given its geography on three islands connected by dozens of bridges and tunnels, is expressed by physical borders, such as the ever northward-shifting boundary between the ultra-rich Upper East Side and working-class Hispanic and black Harlem somewhere in Manhattan's east nineties and beyond them, across the Harlem River, the equally impoverished South Bronx section of the city into which the novel's wealthy main character, Sherman McCoy, and his mistress accidentally stray coming back from JFK Airport in Queens. Although he's a bond trader on Wall Street, one of the people whom Wolfe dubs "The Masters of the Universe", rather than a property speculator, McCoy belongs to the same glitzy, greed-fuelled world of eighties New York as Donald Trump. It must be almost twenty-five years since I read it, but given that quite a few of the novel character's are based on real people - such as the Rev. Bacon, a thinly disguised Al Sharpton - it might be worth a flick through its eight hundred or so pages to see if I can spot the Donald.